LZ Ike had been built in April by C 2/5 Cav, and had proven itself to be a major threat to Communist efforts to move men and material into the Saigon area. The company worked out of Ike during the entire month. Because it was adjacent to a series of trails known as the Mustang Trail, Comanche saw frequent combat as we intercepted NVA porters of the 82nd Rear Service Group carrying supplies, or NVA regulars moving towards Tay Ninh City and Saigon. This photo was taken by Jerry "Doc" Watson with an Instamatic camera as his slick flew over Ike. While working in Tay Ninh Province in the vicinity of the Mustang Trail, Tall Comanche began a routine combat assault. However, after the first lift (of three) had been safely inserted in the new LZ, and the helicopters had returned for the second lift, the PZ came under attack just as the birds began to lift off. 3rd Platoon was on board those helicopters. Mike Hayes remembers the door gunner on his bird getting hit in the arm. 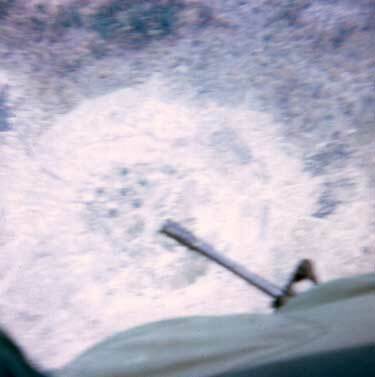 Doug Young remembers seeing little holes appear in the skin of the helicopter. Mortar rounds were impacting among the platoon left on the ground, wounding two. Even though the remaining platoon was under fire, the lift helicopters returned to the PZ to reinsert the 3rd Platoon. PFC Thomas Strathman was on board one of those ships when he was hit in the chest. His helicopter left the formation to take him to medical help, but he died enroute. Comanche was again working out of LZ Ike in the vicinity of the Mustang trail. Late in the day of June 19th, we learned that Company B, 2/5th Cav - Ridge Runner - had been in heavy contact and had many casualties. The next morning, and throughout the day of June 20th, Ridge Runner stayed in contact, and Comanche moved overland to assist them. During the afternoon of the 20th, Comanche took a two-bird log of weapons and ammunition to turn over to Ridge Runner. Later, C Company joined B Company by moving into their position while providing cover fire into the nearby wood line and reduce the amount of incoming NVA rifle fire. Incoming small arms required C 2/5 Cav move back a bit, call in an air strike with napalm, then recon the area again. NVA troops were still in position, and engaged us with small arms, and we fell back to our original positions. By the time nightfall came, the two companies had established a combined perimeter. The area was densely wooded. After dark, the NVA probed the perimeter in several spots in an attempt to mark it for the forthcoming mortar attack. Several small firefights broke out on different sides of the perimeter. During some of these, 1SG "Red" Allen would taunt the NVA and shoot back at the them with his AK-47 - this despite the fact that Top preached the gospel of throwing hand grenades at night so as to not give away one's position. When the mortar attack came, it was very heavy. 3/6 caught the brunt of the attack, and one mortar round landed in the CP foxhole. During the attack, many of the rounds burst in the tree branches overhead, showering us with shrapnel. Even if you were down in your hole, you could get hit. The NVA also fired B-40 rocket-propelled grenades into the perimeter. After the mortars and B-40 firing ceased, the NVA engaged in small fights around the perimeter, but there was no ground assault. Three fine men lost their lives in that attack. SGT Dennis Resinger was a Squad Leader with 3rd Platoon. 1LT Kenneth Susmarski was not technically a member of Comanche - he was undergoing "on-the-job- training" before being given his permanent assignment when he died. He had been in Vietnam only 15 days. PVT Allyn Stevens wasn't a member of Comanche either. He was normally a medic with Ridge Runner, but was sent out to C Company from LZ Ike when one of our regular medics went to Tay Ninh to get new eye glasses. When our medic came back, he went out to B Company. As fate would have it, with both C and B companies in the same perimeter, the two decided to move back to their respective units the next morning. The decision cost Allyn his life. Both the Platoon Leader, LT Paul, and the Platoon Sergeant, SSG Richard Fujiwara, were severely wounded. The "L-T" was taken over to the company CP with a sucking chest wound. The only way he could breath was to prop him up. He even wanted a cigarette, but some strong words from the company commander and Senior Medic, Jerry "Doc" Watson, helped change his mind. LT Paul would have died that night if not for the bravery of a Medevac crew. Though there was no place to set down a helicopter, a small LZ was blown with C4 wrapped around the right trees. Even with some sniper fire coming in, and the tips of the blade slapping the trees, the bird came in and got him. During the night, we had Spooky on station. At our direction, he would hose down an area with mini-guns. Jerry "Doc" Watson wrote his own recollection of this action. Click here to read it. Sometime in June, Comanche enjoyed a rare luxury - we were brought in to Tay Ninh Base Camp for a three day stand down. This was a chance to have weapons repaired by the Ordnance detachment, get clean uniforms - even go through a shower and get de-loused. The best part - we got to sleep in real bunks. Contrary to most divisions in Vietnam, the 1st Cav operated almost exclusively "in the weeds." Staff Sergeant Russ Griffith was a "Shake 'n Bake." While the name referred to a food product, it was also a derisive term for those who went through a special school and were promoted to Sergeant E5 upon graduation. Contrary to the image, most "Shake 'n Bakes" were damned good NCOs who led their troops well. 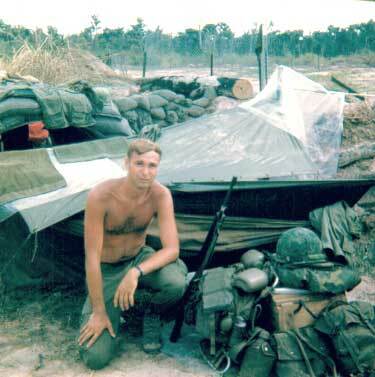 This picture was taken of Russ at the Stand Down center in Tay Ninh. Jerry "Doc" Watson was the medic assigned to 1/6 (1st Platoon.) Here he's shown showing off his palatial digs on LZ Ike.